China's Tianzhou-1 cargo spacecraft performed an automated docking with the country's orbiting Tiangong-2 space lab Saturday (April 22), according to the Beijing Aerospace Command and Control Center. The robotic Tianzhou-1 was lofted atop a Long March-7 Y2 rocket Thursday evening (April 20) from Wenchang Space Launch Center in southern China's Hainan province. "Tiangong-2 has taken over Tianzhou-1's functions," he said during an interview on Chinese news outlet CCTV-Plus. "They used to be two separate spacecraft, so to make them a combined body, we need to properly integrate relevant resources and information. Therefore, we are planning to shut down other functions, like cutting off the power supply to the docking equipment. "The docking process went very smoothly today," he added. "Now the combined unit is quite stable. As planned, we will make preparations for refueling tomorrow and replenish both fuel and oxidizing agent to the Tiangong-2 space lab." 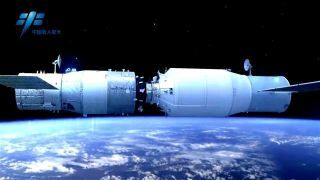 According to the country's space planners, the cargo ship and Tiangong-2 space lab will carry out two additional dockings. According to CCTV-Plus, the second docking will be conducted from a different direction — a procedure that aims to test the cargo ship's ability to dock with a future space station from different directions. A third and final docking will use fast docking technology. Whereas it normally takes about two days to dock, fast docking will take only 6 hours. A 29-step refueling script will take place over several days, Chinese officials said. China aims to have its own space station up and running by the early 2020s. The Tiangong-2 space lab has been in Earth orbit since Sept. 15, 2016. Chinese state-run media report that Tianzhou-1 is loaded with roughly 6 tons of goods and propellants. The combination of Tianzhou-1 and Tiangong-2 is expected to fly together for two months, during which time the two spacecraft will conduct in-orbit liquid propellant refueling and carry out various experiments. Tianzhou-1 is China's largest and heaviest spacecraft, with a length of 35 feet (11 meters), a diameter of 11 feet (3 m) and a weight of 13 tons (12 metric tons). Though the Tiangong 2 space laboratory (whose name means "Heavenly Palace 2") is currently unoccupied, two Chinese astronauts spent a month there last October. The astronauts' mission, known as Shenzhou-11, lasted 33 days — China's longest-ever piloted space trek. The Tianzhou-1/Tiangong-2 mission is viewed by China’s space planners as a crucial step toward the country's goal of establishing a permanent space station around 2022.